The ANS04-ES is an IP65 rated sample and hold Ambient Noise Sensor which is designed to operate under extreme temperatures, from -40°C to +50°C. The ANS04-ES will work with the whole range of ASL Public Address and Voice Alarm systems and with ASL’s VIPA IP-based PA systems. 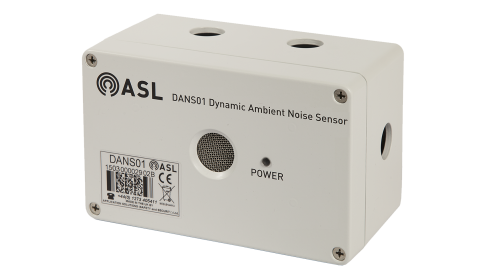 The purpose of an Ambient Noise Sensor (ANS) system is to adjust the level of public address announcements based on a measure of the ambient noise in the PA zone. This will maintain a set volume of public address audio above the ambient noise, in order to guarantee that the announcement is intelligible, yet at a comfortable level. Each ASL Public Address or Voice Alarm system is able to support the connection of multiple ANS04-ES units. 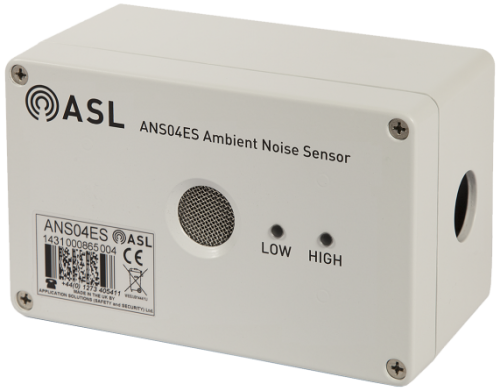 The ANS sensor detects ambient noise using its built-in microphone. The detected signal is weighted with a speech-band response for the best system performance, and is then translated to a value of measured ambient noise in dBA. This value is used to proportionally adjust the Public Address or Voice Alarm system output gain for the configured output channel or channels. The system is set up for the maximum broadcast volume without the ANS sensor, and the ANS system then reduces the gain from this level when the zone is quiet. • PA announcements dynamically and constantly adjusted to suit the current ambient noise• Reduction of PA noise abatement problems• Retrofittable to VAR12 and VAR20 Routers with software upgradeASL Dynamic ANS System constantly maintains the volume of Public Address announcements just above the ambient noise, guaranteeing that announcements are always intelligible, and not excessively loud. The DANS System employs digital signal processing technology to distinguish the ambient noise from the announcement. This enables adjustments of the broadcast volume level to reflect any variations in ambient noise, even while the announcements are being made. Consequently the overall intelligibility and comfort of announcements are improved over traditional ANS systems, and Public Address noise abatement problems are also improved. 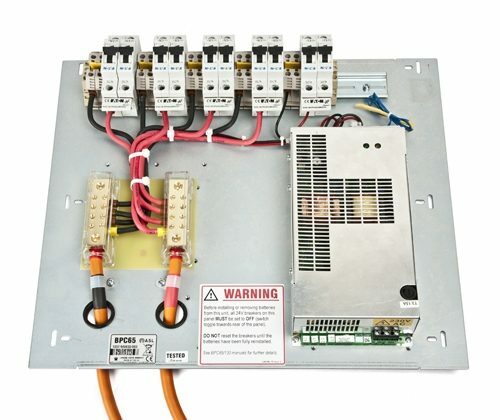 The BPC65 and BPC130 are 19” rack mounting self contained battery backup systems for use with VoiceAlarm systems. 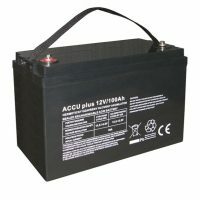 The BPC65 provides 65Ah of battery capacity with a 6-amp recharge rate while the BPC130 provides 130Ah of battery capacity with a 12-amp recharge rate. Both systems feature temperature compen-sation of the charge voltage to maximise battery life. The units are fully monitored to the requirements of EN54-4 and BS 5839 part 8 and provide fault-reporting outputs to the VAR series of Audio Routers. 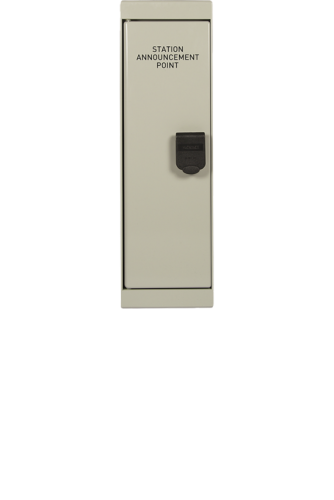 The SAP02 Station Announcement Point is housed in an IP65 vandal resistant, lockable wall-mounting box. It is designed to work with the whole range of ASL Voice Alarm and Public Address systems, and is normally used for making announcements to station platforms. 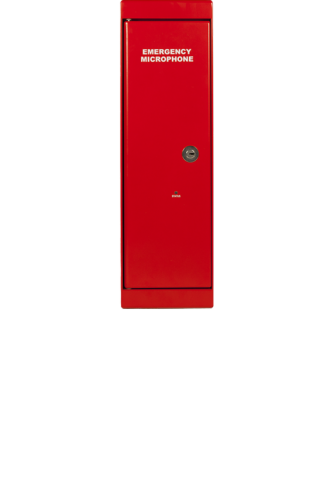 The unit features indicators for ‘Busy’ and ‘Speak Now’.The SAP02 supersedes the earlier SAP01 Station Announcement Point and its mechanical design provides improved protection against water ingress, is more robust internally, and provides easier installation and operation. Additionally the back box has a splash protected drain hole to provide drainage of unprevented ingress of liquid.A processor within the Station Announcement Point interfaces all LEDs and switches to the Router by means of a serial interface, while microphone audio is provided as a balanced 0 dBu (nominal) analogue signal. The unit features a built-in signal limiter to accommodate varying operator technique. The microphone’s processor is also responsible for generating an outgoing low-frequency surveillance tone which is used to monitor the audio connection to the Router, while microphone capsule monitoring is performed by injection and monitoring of a signal such that either open or short circuit of the capsule or associated wiring will indicate a fault. 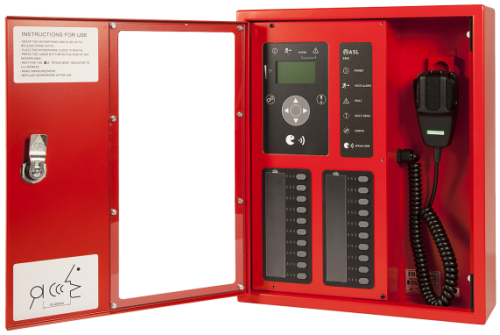 The EMS10, EMS20 and EMS50 Emergency Microphone Stations are EN54 compatible emergency microphones which provide live and pre-recorded message broadcast into user selected zones. The EMS10 provides 10 button selection capability whilst the EMS20 provides 20 buttons, and the EMS50 is formed from a 20 button EMS20 together with an additional 30 button EMX30 expansion unit. All microphones also provide EN54 compliant emergency functions and all EN54 mandatory indicators and controls.The microphones are housed in a lockable wall-mounting box and feature a graphic LCD display together with indicators for ‘Power’, ‘Voice Alarm’, ‘System Fault’, ‘Fault’ and ‘Speak Now’. The LCD display provides remote access to the list of active faults in the PA/VA system, while the EN54 mandated control keys enable navigation through the fault list, and also provide remote fault acceptance and clearance.The microphones have multiple PA/VA system interfaces and can be connected directly to either one or two ASL audio routers, enabling multiple options for system redundancy. The microphones will operate in an All-Call hardware bypass fallback mode even in the event of processor failure within the host Voice Alarm Router1. This hardware bypass function also operates across whole facilities when the microphones are used in conjunction with ASL’s Intellevac safety audio network. There is also a non-EN54 RJ45 Ethernet IP interface with Power over Ethernet capability2 for VoIP connections to ASL IP based PA/VA systems. All interconnect cabling and the microphone capsule is continuously monitored for open and short circuits.